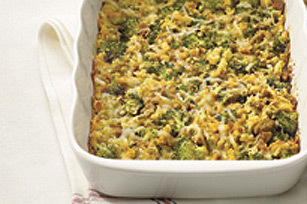 Stuffing mix and broccoli combine with a creamy sauce in this savoury side dish. You can even make it ahead for a shortcut to supper. Combine Miracle Whip and milk in large bowl. Add remaining ingredients; mix lightly. Spoon into 12x8-inch baking dish sprayed with cooking spray. Assemble recipe as directed. Refrigerate up to 24 hours. When ready to serve, bake, uncovered, in 350°F oven 25 to 30 min. or until heated through. For an easy one-dish meal, add 2 cups chopped cooked turkey or chicken to broccoli mixture before baking as directed. Prepare using your favourite frozen vegetable blend.